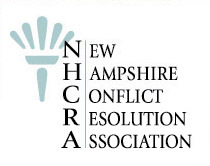 The New Hampshire Conflict Resolution Association (NHCRA) is New Hampshire's largest statewide non-profit organization, dedicated to promoting and enhancing the practice, public understanding and use of peaceable and effective conflict resolution. NHCRA is governed by a Board of Directors, consisting entirely of volunteers elected by the membership, to serve three-year terms on a staggered basis. Officers of the association are elected annually by the Board of Directors. Most of the real work of NHCRA is done by its Committees. An amazing team of volunteers work together to brainstorm, develop and implement a wide range of programs, workshops and initiatives aimed at accomplishing NHCRA goals. If you are interested in learning more about our committees and the rewarding work they do, please visit our committee page. NHCRA members come from all walks of life. Since conflict touches nearly all 1.3 million New Hampshire residents, our membership includes mediators, educators, neutral evaluators, counselors, financial experts, health care professionals, arbitrators and attorneys, as well as members of the general public. We hope you will consider supporting NHCRA, by becoming a member today.